Roland has just announced the availability of a new high-resolution audio recorded called the R-07. The convenient, hand-held recorder features multiple recording modes making it ideal for musicians, journalists and more. 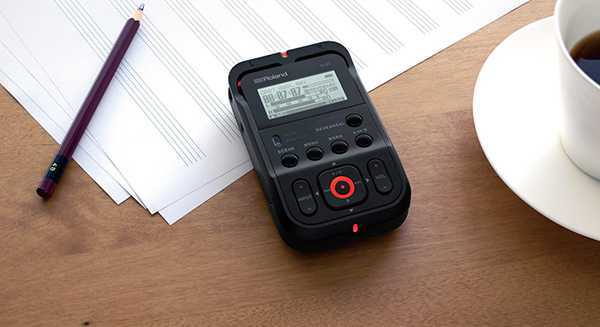 The R-07 features multiple high-quality recording modes, plus unique dual recording and hybrid limiting functions that ensure perfect audio capture every time. It also includes Bluetooth® for remote operation and features Bluetooth-capable audio streaming enhanced with Qualcomm® aptX™ audio technology. The recorder also features an iOS and Android “remote control” app. The recorder itself will capture audio in WAV format at 24-bit/96Khz or 320kbps MP3 files. It is powered by 2 AA batteries or USB. Visit Roland.com for more info.